Do You Want Long-lasting Beautiful Skin? Even women love Mild Manly. 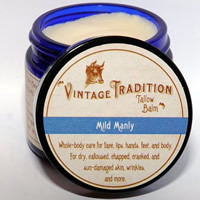 "I'm a very feminine woman, but the Mild Manly Tallow Balm appealed to me the first time I used it! And I'm still loving it. I rotate through nearly all of the scents and have fun doing it, but I keep going back to this fragrance. 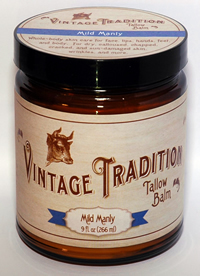 Now, as for the Tallow Balm in general, I'm completely sold on it and here are a few reasons: After using Tallow Balm for several months and many jars, my post-menopausal skin has improved so much that it is remarkable. My skin feels like silk, or like a baby's skin — take your pick. They both are true! I still have some wrinkles, but because all the skin of my face is softer and more supple, the wrinkles are not as visible, so hey, I'm not caring about them any more. The longer I have used it, the more improvement I have seen. So don't be impatient. If you want long-lasting beautiful skin, use this for the long term. I'm so in love with this company and this product! 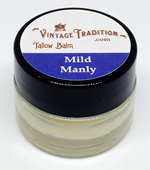 Buy your Mild Manly Tallow Balm in the 9-oz size, the 2-oz size, or the 1/4-oz sample size, and view the list of all our Tallow Balm varieties, all exquisite scents!